The statistics showing that about one million Kenyans are in danger of starvation. This is shameful. Six years under devolution is enough time for Kenya to have achieved food security. Since devolution began, about Sh1.6 trillion has been distributed to all the 47 counties which, if it was used well, could have yielded results. 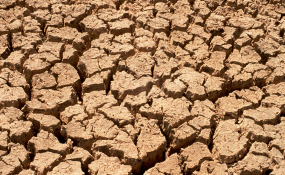 Kenya has been experiencing periodic droughts since independence. However, we have learnt very little from the challenge. The high number of people who die from hunger is cause for alarm. According to a World Vision report, about 15 million children in East Africa are normally affected by hunger during drought. It further indicated that they are usually at the risk of contracting diseases such as cholera and typhoid. Kenya is currently the region's economic powerhouse, yet in the past few months, maize farmers were complaining that the National Cereals and Produce Board was unable to buy maize from them since the national stores were full. Poor planning is the cause of hunger in Kenya. Our nation is well endowed with natural resources that have been underutilised. Kenya has very many rivers and water bodies have been left idle. North African countries that rarely experience rainfall have food security compared to Kenya. It is amazing to note that most of them depend on irrigation agriculture. Kenya imports rice from Egypt, a country that depends on River Nile for irrigation, a river that originates from Lake Victoria. The jubilee government has food security as part of its Big Four agenda. This has now failed mainly due to mismanagement and scandals. Corruption has been the underlying factor behind the failure. The maize and fertilizer scandal are just the tip of the iceberg. Despite counties such as Turkana and Baringo that are worst hit by drought being allocated the highest amount of devolution funds, it sad to note that they have not laid enough strategies to avert the crisis. Lack of storage facilities is one of the problems. Kenyan farmers have their maize rotting in their home stores. Experts state that over 10 million bags were lost in the last harvesting season due to the post-harvest losses caused by infestation by armyworms. As a nation we should go back to the drawing board and strategise on how to achieve food security. We should embrace the scientific methods of growing crops. Our continued dependence on rainfall agriculture is one of the causes of food insecurity. We need to incorporate greenhouse technology and large scale irrigation, which will boost our production.